Introducing the brand new subdivision in Springtown, "Springwood Ranch" New construction on 1 acre in Springtown ISD. Don't miss our Leona floor-plan on 1 acre in Springwood Ranch! This spacious single story plan features 4 bedrooms, 2 bathrooms plus 2 car garage. Encapsulated spray foam makes this home energy efficient and could lower your utility bill. Beautiful granite sits on top of the social island in the kitchen. Wonderful area for entertaining. Breakfast nook is open to a large family room. Wood burning fireplace is perfect for those cold nights. Oversize walk in shower with sitting bench compliments the spacious master suite. Riverside Homebuilders understands the need for storage and accommodates by offing extra deep and large closets throughout the home. New Construction In Parker County By Riverside Homebuilders. Take a peek at this 4 Bedroom floor plan 2069 sq ft.. 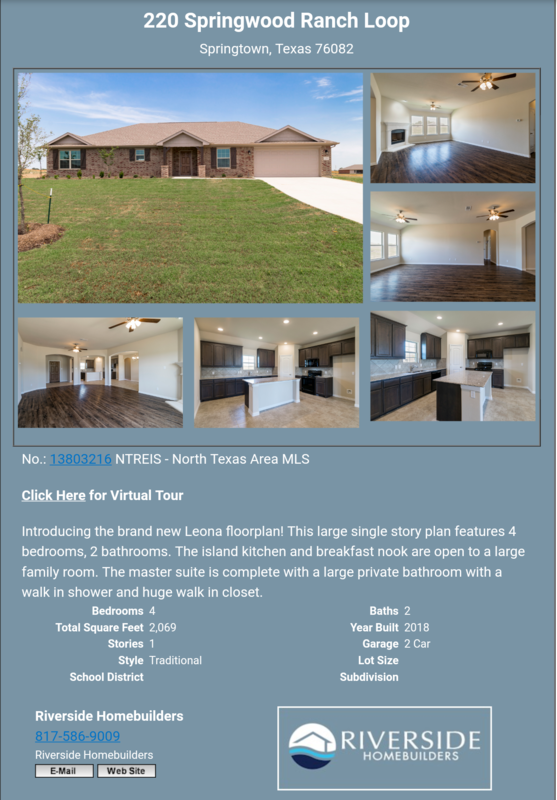 It's the Leona on 1 Acre in Springtown. Stop by our model at 254 Springwood Ranch Loop for more details. Check out our community by clicking here. Pictured above is 220 Springwood Ranch Loop / Springtown, TX 76082 / 4 beds 2 baths 2,069 sq. ft.
$259,900 on 1 Acre Home-site. Melissa, best wishes for your post to attract multiple buyers for this beautiful 4 bedroom 2 bath ranch for sale in Springwood, Texas! Hi Melisa, This is a beautiful home with so many desirable features. Congratulations on this listing. I am sure you will find a buyer real soon.